You may have never tasted watercress, but you’ve likely heard of it. It’s a peppery tasting, delicate leaf vegetable related to broccoli, kale, and collards. And like just like those other vegetables, watercress offers some amazing health benefits. 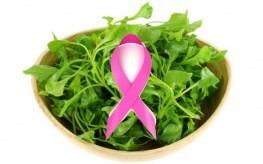 One new study from the University of Southampton indicates that watercress could even be useful in the fight against breast cancer. According to the study, published in a recent edition of the British Journal of Nutrition, a compound in the cruciferous plant could work to turn off signals in the cells that are used to facilitate cancer growth, thereby starving cancer cells to death. When a tumor outgrows its own blood supply, it sends signals to surrounding tissues to deliver more oxygen and nutrients. Its these signals that phenylethyl isothiocyanate—the watercress compound—may actually shut off. The research is promising, and when paired with research on the benefits of other cruciferous vegetables, we may have identified the family of vegetables that can successfully combat cancer. Broccoli, related to watercress and a nutrition powerhouse in its own right, contains several compounds that may be effective in fighting cancer. One of the well-researched compounds, sulforaphane, has been found to not only suppress the growth of tumors, but also stop the spread and even the onset of cancer. Indole-3-carbinol, another broccoli compound, has been found to destroy cancer-related molecule known as Cdc25A and to reduce tumor size substantially. Cruciferous vegetables have many health benefits and are easy to come by. While more research may be needed to determine how they are able to fight cancer, there’s no reason we can’t start reaping the benefits now.